« Alan Bollard’s doppleganger is Sheriff Joe? Why negative advertisements are powerful, essential, and sometimes (see “Daisy”) even artistic. It includes this distinction, which touches on some of the discussion we’ve had here earlier about political activists like Cameron Slater purporting to be ‘media’ when they’re really just campaign propagandists, slanderers and attack dogs. Doing it [negative campaigning] right doesn’t necessarily mean doing right by the facts. An effective attack ad doesn’t require strict accuracy as long as its broad caricature rings true. It has to land a punch as propaganda, not journalism. “…trying to sue me for defamation and claiming damages of $200,000. …It appears he hasn’t used a lawyer for this. I’ll apply to have it thrown out as vexatious. In his own words he said that everything I had was true. His emails, his hard drive, his documents, his story … and now he is trying to shut me and other media down. “For a start I am not a journalist” — Cameron Slater. 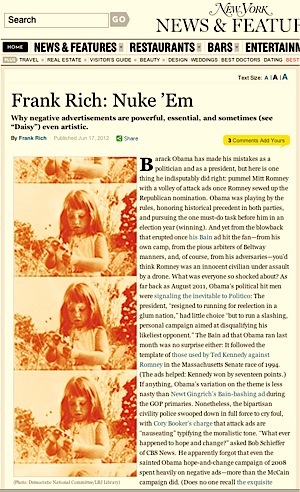 Anyway, read Frank Rich’s article about negative campaigning. You may recognise some archetypes. And some of the tactics. Slater is trying to have a foot in both Camps when it suits him. So do you consider your self a Journalist or a Blogger? Good question. I try to bring a journalist’s sensibility & approach to the richly opinionated world of internet commentary. But I really try to be truthful and fair … and not a treacherous propagandist … like, well, you know. You have just made the same argument. That anyone including Cameron Slater can use. Except without question you handle detail with far more maturity than the likes of Cameron Slater who often end up slagging people off. So this journalistic approach you try and bring by applying truth and fairness. Find me a Post you have done here. which has either has had painted a positive picture on National or a negative picture on Labour and its hangers on. I will save you the effort. In my time reading here. I cannot recall one. I may be wrong but this weighting would be 90s to 1’s So I am sorry to say you cannot claim to be Truthful and or fair. Hiding behind the but I do it so nicely does not undo the hypocrisy. Yeah, I know that’s your opinion Craig. But your inference that (in your opinion) I’m ‘Labour’ because you’ve noticed some criticism of the government is like declaring I must be a vegetarian because I criticised a burger from McDonalds. I’m not ducking and diving. I’m just not a party political animal. In fact I’m repelled by the partisan-to-the-point-of-sectarian trash-talk that passes for political discourse in some quarters. I hope we can disagree about this, you and I, or Ivan and I, poormastery & I, etc, as we do about other things, without resentment. I don’t have any resentment. But is rather important considering the large part (like 90%) of your topics here. I see exactly the same criticism you plaster on others happens right here. The difference you do it more articulately and more eloquently. I just find hypocrisy to be so frustrating. Your analogy is way off base. If your analogy was I must like KFC because every article/opinion I have written on Fastfood was critising McDonalds, then I would agree more. I know your not ducking and diving but it does not change the reality of you claiming to applying truth and fairness. Don’t you even find it even slightly hypocritical you claim to be Truthful and Fair. and yet you have not critised Labours nor its partners and on the flip side I fail to remember any positive reflections to National and its partners. Might aswell throw Apple in there as well. Thanks for sharing your concerns Craig. Despite your inference, in my view, there’s no politically motivated agenda in my choice of subjects for this blog (or ‘targets’). Part of the miracle of the human brain is the aspect of ‘pattern recognition’. Combined with the problem of paradigms — where an observer starts to filter reality to support or confirm his or her supposition or theory of how things are – it’s easy (for you and me) to engage in self-reinforcing ‘noticing’ of other people’s biases … irrespective what’s actually happening out there. I think we’re all hypocrites to a certain extent. We’ve talked before about the very human tendency to give amnesty to those with whom we tend to agree. Telling the truth (not the Truth, Craig!) rather than the half-truths or spin I sometimes detect is an important value to me. And I try to be fair, by which I mean not distorting or misrepresenting what someone else might be saying to make my argument easier. I thought you had let me off the homework assignment to locate posts which don’t fit your perceived pattern? … but I really don’t have time to get bogged down in the forensics of the question. You’ve outlined your impressions. Fair enough. re Resentment: No, I don’t think you do. That was my point. We already disagree about other things.